Wargaming Forum and Wargamer Forums > Warhammer 40K > General 40k > Care to help a new player out? I've been reading the Hors Heresy novels for awhile now and decided I really want my own army to play with but have got some questions before I start building my force. If you have the time I would really appreciate it if you can answer these questions to help me get a better understanding of the game and how things work. I have already decided that I want to play both Chaos Space Marines and Necrons. Chaos has always been my favorite and I love them purely for the models. I plan on making a fluffy list just for casual play, using whatever models look cool (not decided on a Legion yet) and will probably play Necrons as a more "serious" force with more strategy. A) I understand that there are different types of playing. You can run an unbound army where you are free to take whatever you want. Then there are formations or detachments and you have to have certain units and you get special bonus rules and buffs. I think Necrons have their own special kind of detachment called a decurion but I'm not 100% sure. How important are these detachments/formations? There's 2 things I'm afraid of. 1) I don't use a formation and my army really suffers from not gaining the special bonuses. or 2) I buy a bunch of models for a formation, then the next codex comes out and I have to buy all new stuff because the old formation is useless. I like the idea of picking what I like and I also like the idea of getting buffs. I don't want to shoot myself in the foot when building my first list,especially because on different forums I see that (apparently) Chaos is in the lower tier of playable armies. B) Okay, suppose I want to paint my CSM army using the Thousand Sons colors. Are you allowed to take a special character like Kharn, paint him in Thousand Sons colors, and use him in your army? Now, I can understand if you are not allowed to put X character in a Y army. What I mean is, "Hey I know my army is painted like Death Guard, but they all have marks of Slaanesh and I have Fabius Bile as my HQ painted in Death Guard colors." C) Can you buy Chapter/Warband icons? Like if I were playing Blood Angels and wanted their symbol on my armor and banners or maybe on tanks. Do they sell stickers or stencils for this? D) There are a ton of different weapon options for your models it is a little intimidating for a new player because I don't know what is "good" or not for how I want to play. Is magnetizing weapons easy for most models, including HQ's? I think those are the major questions I had. I am thinking of starting with Necrons first. Their detachments seem a little simpler and with Chaos there are just so many options it's a bit overwhelming. From what I hear the Necron detachments are good(although this was told to me in 7th ed) and maybe following a detachment outline might make army building easier for a new player because there's already a rough guideline to follow rather than, okay just go buy stuff! I know I need to pick up the Necron (and Chaos)codex but are there any other sources you would feel that would help me plan out my force? Ive tried reading army lists online but it's hard when you don't really understand how good those weapons are or their matchups I should say. I am really, really excited to get started playing. I currently play Warmchine and Hordes with some friends but we were talking about starting 40K (some of them also play Age of Sigmar but it never interested me) Work has me running long 12+ hour shifts so I'll try to check back on here when I have time. I'm gonna recommend against this mostly just to avoid confusion and frustration on your opponents' part. You can make up your own colour schemes of course, so long as it's clear what's being played. You will also find that models with specific thematic rules like Rubric Marines won't match well with models like Kharn because of how their rules are written. There are five Marks of Chaos, and they tend not to be compatible with each other. If you want to paint your models different to the ones on the box, try not to directly copy the scheme of an opposing force in the same faction, if that makes sense? As in don't paint Death Guard to look like Emperor's Children, or World Eaters to look like Thousand Sons. It's weird. Yes. Games Workshop and Forgeworld both make these kinds of customizable options. There are also third party manufacturers such as PuppetsWar who make after market additions that are compatible with the GW model range. Those these are not the same specific chapter symbols as copyrighted by GW, in many cases they are similar enough or even interesting enough to warrant use. Bear in mind that most GW stores these days will only tolerate the use of models and parts that they themselves sell for gaming in store. Generally yes, though there are some models being released lately that are noticably more difficult to customise. In the region of Chaos Space Marines, you should manage fairly easily for the most part. A new edition of the game has just been released, and the rules have been overhauled from the ground up. From what I've seen, you will be able to make use of pretty much any weapon option one way or another so you shouldn't fear too much the thought of choosing a bad weapon. On characters, power swords seem a solid bet this time around. The main rulebook as well as your own army's codex (or index as the case currently is) should be all you need to start learning the rules. If your playing 7th edition 40k than yes, there are quite a few formations and deatchments out there for various armies to use. The Necron Decurion detachment is a detachment that is made up of formations, it has buffs and restrictions. How important are these detachments/formations? In the Necron Decurion detachment, the reclemation legion formation (a formation you are required to take in the detachment) gets a bonus to their reanimation protocols, a way for them to mitigate the damage they take. 1) I don't use a formation and my army really suffers from not gaining the special bonuses. Every detachment and formation has their strengths and weaknesses, some are better than others but each one is for different playstyles. 2) I buy a bunch of models for a formation, then the next codex comes out and I have to buy all new stuff because the old formation is useless. There is a chance for this to happen, however GW has made it pretty clear with this newest edition that they are not going to let that happen easily. I like the idea of picking what I like and I also like the idea of getting buffs. I don't want to shoot myself in the foot when building my first list,especially because on different forums I see that (apparently) Chaos is in the lower tier of playable armies. In 7th edition yes, however as Serpion and I have both mentioned their is a new edition that has changed things up. Whether every army remains in its respective 'tier' from the previous edition has yet to be seen, but I wouldn't worry about that because there is a lot of variety and more yet to come. There are chapter specific troops boxes that positively drip icons for chapters like the Blood Angels and Space Wolves. There are also uprgrade sprues and kits for many of the more popular chapters like Dark Angels, Ultramarines, Imperial/Crimson Fists, and Iron Hands, as well as the previously mentioned chapters. Forgeworld produce vehicle upgrades for pretty much all the first founding chapters between their Horus Heresy and 40k ranges, as well as some stunning decal sheets. They do beautiful infantry upgrades for all the Heresy era chapters that are comaptible with all the plastic kits. It's also worth noting that all standard plastic marine kits, be they infantry or vehicles, come with generic decal sheets that cover the the bigger chapters as well. I love all the Traitor legions so much it's so hard to pick one color! I'm more than likely going to go Iron Warriors because I fell in love with them ever since I read the Storm of Iron novel. Plus they got those awesome chevrons! I asked some of the people at my FLGS about painting characters different colors to match my army scheme and they seemed ok with it. One player actually did that; he painted his army his own custom color scheme but runs Nurgle themed army full of plague marines led by Typhus. Hopefully I can get a copy of the index soon so I can start planning out my army. I plan on collecting most of the chaos models so I'll have lots of possible forces to play with. My Start Collecting set for Mechanicus Skitarii guys came with decals. They're water slide transfers rather than stickers. WarhammerTV on Youtube has a video or two about applying them. One thing people do is make a semi-cohesive scheme for the different legion cult troops by doing a common shoulder pad colour. Or doing a common colour everywhere else but then have the cult colour on the shoulder. If you do something like that across your whole force and then base texture/paint them all the same they'll look like they belong together while still having the unique colours you want. 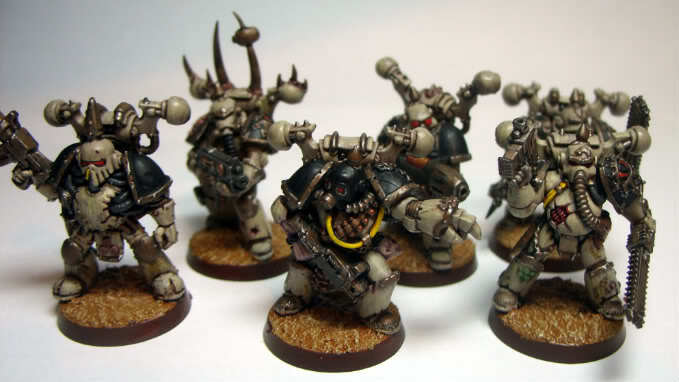 In game terms you'd need to choose whether or not they count as plague marines with the Black Legion keyword or are death guard with the death guard legion keyword who just happen to also work with Abaddon in a combined "Chaos" or "Heretical Astartes" faction detachement. Where this will matter in the rules is if you have a character that says "Death Guard within 6 inches" get some sort of bonus or "Black Legion within 6" get some sort of bonus. You have to pick who they actually are when you build the list. But you see how you could do something similar with all the different cult troopers like berzerkers or noise marines or even rubric marines. There are renegade groups (especially the Black Legion) that accept any chaos troops who are willing to bend a knee and swear loyalty. When you paint a specific character to join your warband you can of course paint it how you like, but make sure you don't get the keywords on the abilities confused. A an ability that says "Thousand Sons within 6 inches" get a bonus isn't going to work on your chaos marine squad just because you painted Ahriman to match their colour scheme. Another good rule of thumb is to not do anything that would confuse your opponent. Paint your models as you like, but if you start doing things like that so you can get abilities to work on faction models that don't share the right keyword, that would be just cheating. Last edited by Nin; 06-21-17 at 07:01 AM.